Our sweet little dog Cooper passed away suddenly on Wednesday night. He was my first dog. Before Cooper came along, I never quite understood the degree of affection that people have for their dogs or the grief that follows their loss. I understand it now. Cooper was our family Christmas gift in 2006. The boys had been bugging me for a couple of years to get a dog and I always said, "No, they're too much work", but they finally wore me down. So, I agreed to get a dog with the stipulation that I would choose the breed. I sure as heck wasn't about to let them bring home some hyperactive, Cujo-esque devil dog, so I did my research on dog breeds. 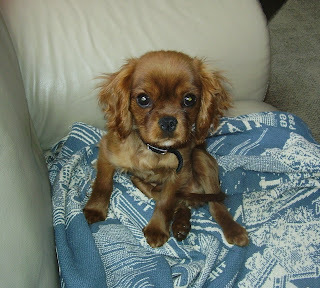 I read that Cavalier King Charles Spaniels were calm, affectionate, small in stature and easy to train, and I decided that a Cavalier would be a good breed for our family and a good first dog for me. It also didn't hurt that Cavaliers are ridiculously cute. I found a breeder in Gettysburg, PA who had one pup left and we made the trek out there a couple of days after Christmas. I'll never forget the first time I saw him. We were sitting in the breeder's living room and Cooper came trotting out like he owned the place. We all got down on the floor to play with him and he showered us with wet kisses, his little whip-tail wagging a hundred miles a minute. He was pure joy and there was no question that he was ours. A half-hour later, we were on our way home with the newest member of our family. The remaining (almost) 6 years with Cooper were a blessing. He was funny, affectionate, gentle, intuitive, undemanding and just so easy. I think we all learned lessons from him about patience, unconditional love and selflessness. Those, I believe, were his biggest attributes. He didn't mind playing second banana when our boxer, Roxy, burst onto the scene two years ago; or if he did, he never showed it. He didn't get aggressive when she would steal his treats or body-check him out of the way when we were petting him, and when he'd had enough of her using him as a chew toy, he'd go sit under one of our cars in the driveway and wait until she found something else to do. He never held a grudge, either. Even if Roxy was being particularly bratty towards him, he would always snuggle up with her on the couch. Cooper would lay on his "perch" on the back of the couch looking out the window, and Roxy would sit on the couch and rest her head next to him (or on him, as was often the case). One thing that struck me after Cooper passed was the realization that he never cried. He never cried, never whined and never complained. Cooper was plagued by back problems throughout his life, but you'd never know if he was in pain because his tail was always wagging. It was only when he would have trouble climbing up the stairs or collapse in the yard that we would know his back was acting up again. But he always bounced back. Even on the day Cooper died, he didn't complain. I can't even begin to think about how uncomfortable he must have been. About a week before Cooper's passing, I took him to the vet for his yearly check-up. I was happy to tell the vet about how good he seemed to be feeling lately. His back didn't seem to bother him and he was almost as energetic as he was when he was a puppy. Then the vet listened to his heart and told me that his grade 1 heart murmur had escalated to a grade 4. She assured me that this was not an emergency situation and it was nothing to be overly concerned about, but that we should start thinking about finding a cardiologist for him. I made an appointment for him to get his teeth cleaned in a couple of weeks and she said that while he's there for the cleaning, she would do a radiograph of his heart to make sure that it wasn't enlarged. So that was that and we went home. Cooper seemed fine until the day he died. He was coughing when he woke up that morning, which was unusual, but it was something the vet told me to look out for as one of the first signs of congestive heart failure. He seemed ok after that, although he didn't have much of an appetite. That night, his breathing became rapid and we decided that we would take him to the vet first thing in the morning. He went outside and did all his normal stuff and went to bed at around 10 p.m. A couple of hours later, I found him. He was in his bed and in his usual sleeping position, but he was gone. When I spoke to the vet the next morning, she told me that Cooper must have died from a ruptured Cordae Tendineae, which is a rare complication of mitral valve disease in dogs. She explained that the Cordae Tendineae are thin, cord-like tendons that connect the papillary muscles to the mitral valve in the heart. If one breaks, the valve cannot open or close properly, thus causing immediate heart failure. She said there was nothing that we, or anyone, could have done to save him. In the past few days since Cooper's passing, I have researched the "cordae tendineae" ad nauseam, in part to learn as much as I can about the thing that took Cooper's life, but perhaps more so to assure myself that there wasn't anything I could have done to prevent it. But the most remarkable and oddly comforting thing I've learned is that the cordae tendineae are also colloquially referred to as the heartstrings. How fitting for a dog like Cooper. A dog who was so full of love and won the affections of everyone he met. Even people who don't like dogs couldn't help but be charmed by him. Cooper pulled at our heartstrings. That's how he lived and that's how he died. Although we miss Cooper terribly, I'm so grateful for the short time we had with him and for the lessons that he taught us. I'd like to think that he's frolicking in doggie heaven right now and that he'll be there to greet us, leaping around with his tail wagging, when our time comes - just like he did every other time we came home. Well said Liza!!!! This brought tears to my eyes..... RIP Cooper! Such a sweet dog. A true master on the HEARTSTRINGS.